Nature is the theme of the free trade show featuring a number of unique vendors. A wide selection of optics, photography, paintings, and one of a kind gift items for the nature lover in all of us will be featured. Visitors of all ages will enjoy the many festivities during the celebration. The Festival include presentations from world-renowned speakers at The University of Texas Marine Science Institute, photography workshops for nature and birding and a variety of field trips. Sandcastle is making exterior improvements to enhance this premier property for your future enjoyment. Throughout the Fall and Winter of 2016 Sandcastle Condos will have contractor crews performing exterior renovations throughout the property including the pool and hot tub in January 2017. This work will be limited to Monday through Saturday. Sandcastle Condos Management will make every effort to limit the inconveniences this will cause our guests. Sandcastle Condos does appreciate your patience throughout this process and we know you will enjoy and love the finished product. New Ball Game this week!! Red Snapper Season opens June 1, 2016!! So make sure you have your reservations made. 8 hour trips caught King Mackeral, Atlantic Sharpnose Sharks, Vermillion Snapper, and Ling. 5 Hour trips caught King Fish, Ling, and Shark. Plus we caught a bice 47# Ling on the 5 hour trip on Sunday! The Bay trip had nice catches of Gafftop, Whiting, Shark, Jack Cravelle and Sand Trout. Private Bay Guides brought in nice catches of Trout and Redfish. Our 8 hour trip this week caught Kingfish, Ling, Vermillion Snapper and a Black Tip Shark. 12 Hr Trip had a nice catch of Amberjack, Ling, Kingfish, Dog Snapper, Silk Snapper, Dog Snapper, Lane Snapper, Vermillion Snapper and a Black Tip Shark. 5-8-16 24 Hr Trip aboard the Gulf Eagle with Capt Kevin Hollar and Capt Jeff Wilson hauled in some nice Amber Jacks, Blackfin Tuna, Wahoo, Kingfish and Atlatnic Bonita. Warren Roberson and Friends from San Antonio, Texas were aboard the Gulf Eagle on the 24 hr Trip. Pictured are: Frank Sutton, Ed Roberson, Seth Smith, Jane Robles, Keith Menges, Warren Roberson, Mike Rodriguez, William Rodriguez, Christian Harris and James Johnson. The Love for Fishing - BROTHERS Warren Roberson hauled in a nice 41# Amberjack and Ed Roberson had the 31# Amberjack. The Bay trips had nice catches of Gafftop, Whiting and Sand Trout. Private Bay Guides have been bringing in limits of Red Drum with a few Black Drum. Spring Time in Port Aransas/3 Things to know about Vacationing in Port A in the Spring. Time to take a Spring Break! Port Aransas is a beautiful place to be in the Spring at the beach in Texas! Although most avoid the party side of Spring Break in March, there are those who enjoy the beautiful beaches of Port Aransas after the party ends. Port Aransas vacations tend to lean towards enjoyment, relaxing and taking a break from it all…but sometimes in the summer you don’t receive a very personal and intimate time due to the high volume of travelers. If you haven’t tried visiting Port Aransas in the Springtime, try it just once! And if you are here, these 3 things to know about visiting our beautiful Port A will benefit the time you spend here with us. If you know spring then you know that the weather is sometimes hit or miss due to the season but we think our beach is pretty all the time! Be sure to pack a light jacket and a pair of pants. When the sun goes down it can be chilly sometimes. Just to be on the safe side... You just never know what you’re going to get during the Spring time in Port Aransas, Texas. When you’re away from home it is better to be safe than sorry so it never hurts to bring a bottle of mosquito spray anywhere you go when you’re traveling in Texas. Bring a Camera! Spring is the prettiest season of Port Aransas. Everything is in bloom from the dunes to the landscaping. You are sure to catch beautiful hibiscus and so many native wild flowers during the spring season. You will appreciate the memories and so will your friends. This is also a great time of year to take family shots with all of the natural beauty that will be gleaming around you. There are so many things to enjoy during the Spring in Port Aransas. 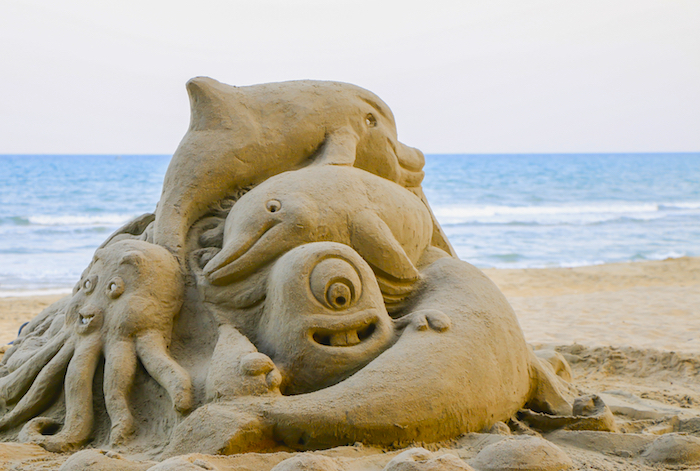 For one, Texas Sandfest is the largest sand sculpting competition in the world and it is hosted right here in Port A! Competitors travel from all over the world to sculpt in this “invitation only” event. Three days with master creations of sand, entertainment, family fun and beach. The Texas Sandfest is a great festival for families as well as the adult age. This year’s dates for the Texas Sandfest in Port Aransas are April 29-May 1st, this is a Friday-Sunday event and with a $5 purchase of a wristband, you are able to roam about the grounds and return each day with out paying-as long as you have your wristband. Children 12 and under get in for free! Besides Sandfest, there are a couple of fishing competitions during April and May. Such as the IFA Redfish Tour that is presented by Cabelas (April 1st-3rd 2016) and the televised HT-3 professional fishing competition (May 18-21st, 2016). Every First Friday of the month there is an art reception that is open to the public at the Port Aransas Art Center starting at 5:30 pm. You can enjoy great local artists and refreshments as you experience the Port Aransas community and celebrate this art festival with them. Our 8 hour trips this week caught Vermillion Snapper, Scamp Grouper, Amber Jacks, Dog Snapper and North Atlantic Sharpnose Shark. Our 12 Hr trip hauled in Amber Jacks, Vermillions Snapper and Atlantic Sharpnose Sharks. 18 year old Alex Schar from Boyse City, Texas caught a nice 47# Amber Jack on the 12 hr 3-26-16 Aboard the Pelican with Capt James Wheeler. Bay Fishing have been catcing alot of Gafftops and a few Whiting. 3-25-16 8 year old Balin and 11 year old Zach from San Antonio, Texas had their hands full with Gafftops and Whiting aboard the Kingfisher with Capt Marvin Horner. Private Bay Guides have been limiting out on Red Fish. Originally a beach-play date, “The Texas Sandfest” is now the largest sand sculpting contest in the world. What started as something to keep the kids distracted as 2 young mothers relaxed in chairs while helping the kiddos create “sand works” of art is now something regarded as a very popular event that Port Aransas hosts. And when we say popular, we mean popular! This event will bring 1000’s of viewers/travelers! This event is judged on each artist’s skilled detail work, creativity and most importantly originality. This year there will be two more competitors than last year, with 19 individuals all from different places and only a few that are local sculptors,. The Texas Sandfest contest is an invitational only event and this year is sure to show 2016 skill, style and personality! Texas Sandfest is a non-profit organization that focuses on giving back to the community and raising funds for local charities as well as scholarships for the Port Aransas High School students. The event staff are all local Port Aransas volunteers that dedicate their time to this growing and world renown event. The event staff strive to make Texas Sandfest a huge success and continue to please not only families, but also adults that are out looking for something new to see! This year’s Texas Sandfest dates are April 29-May 1st, a Friday-Sunday event. Surrounding the “art area” will be vendors and the entertainment stage. This stage will host live music all day-all weekend for groovy good vibes. Friday the contest begins at Noon and ends at 6 pm. Saturday and Sunday are considered “all-day” events starting at 9 am and lasting until 6 pm. The judging will take place on Sunday! All wristbands are $5 and last all three days of the event; kids 12 and under get in for free! Don’t forget about the amateur contest and kids events! There will be sand castle building lessons for the kids and an open amateur contest for all ages. Be ready for a Texas time on Texas Sand! We are looking forward to this year’s 2016 Texas Sandfest! 5 hrs trips have brought in Scallop Hammerhead Sharks, Sheepheads and Red Drum. 8 hour trips this week aboard the Pelican with Capt James Wheeler caught North Atlantic Sharpnose Shark, Blacktip Sharks and African Pompano. James DeLarosa from San Antonio, Texas had a nice 27# African Pampano. 24 hr trip on the Gulf Eagle with Capt. Kevin Hallor and Capt Jeff Wilson hauled in 81 Blackfin Tuna, large Amber Jacks, Scamp Groups, Vermillion Snapper, Barracuda and Almaco Jacks. Steve Kessler from Dekalb, IL hauled in a nice 69# Amber Jack and Jonathan Brackley from Katy, Texas had a nice 36# Barracuda. Spring vacation is the treat before the season! Usually the weather is fairly warm and mostly sunny, the water warm enough to go for a swim. There are plenty of things to do and go see during Spring Break in Port Aransas. Here’s a list of our top 5 things to do in Port Aransas during spring break, whether you’re with family or chilling with friends! Along with some local tips to enjoy a safe and fun spring break! Of course this seems like a no brainer and it is definitely a huge part of spring break! You will see tons and rows of cars lined up to reach the sandy beaches, sometimes with wait times over an hour to get on to the beach! The secret here is to wake up early and get set up! Otherwise you will be fighting the crowds as well as traffic, in search of your perfect beach spring break spot. You never know what Texas will offer as far as weather, so it’s best to bring a light jacket just in case it gets a little too chilly! 2. Learn how to Surf! The Spring time is usually the best time in Port Aransas for a great spring surf session! The water is usually green and clear while the waves range from small and crumbly to bigger and strong! The BoardHouse of Port Aransas has many rental boards to choose from as well as anything else you may need to ride some waves. The crew at the BoardHouse are the some of the most helpful individuals and would never steer you in the wrong direction when it comes to surfing! There are plenty of places to get lessons around town also. It never hurts to whip out an old school long board but most beginners should start on a “soft topped” board to eliminate any potential injuries! Remember to swim at your own risk and always let someone know that you’re paddling out! 3. Get a Port A T-shirt! With plenty of gift shops you might not know which has what and the coolest of that! The coolest thing when you’re a kid is to design your own t-shirt, which Destination and the Shark shop will help you do! Pick from so many different designs, colors and shirts to design the perfect memorabilia of your Spring Break Vacation in Port Aransas. This spot is great for the family and cool to go see! There are so many different species of wildlife, birds and fish you will want to stay just to see what comes out! The viewing platform has a look out with a telescope to view the place at long distances as well as see for miles! There are two known resident gators that hang out here-but don’t let that scare you away! The two have been here for years and are very cool to see in person! There are so many different bird species to see. Definitely bring a camera, sunscreen, and binoculars to enjoy this spot to the fullest. And did we mention this is one of the best places in Port Aransas to watch the sunset!? 5. Get on Board Matee! Port Aransas is home to the Red Dragon Pirate ship, which features excellent skits and games for the kids. Take a cruise during the day or at sunset and let the pirates entertain you as you travel into the channel. This ship is prepared for the 21 and over crowd also with plenty of yummy cocktails to choose from! Not only are the Pirates entertaining for the kids, adults will love them also. We guarantee you will crack up with their witty remarks and ship styled humor! We hope you enjoy your 2016 Spring Break Vacation with us here on our beautiful island and are able to enjoy some of our top 5 things to do in Port Aransas during Spring Break!! Remember to stay safe travelling and drink responsibly! Our 8 hour trip this week caught North Atlantic Sharpnose Shark and Vermillion Snapper. Our 8 hour trip this week caught North Atlantic Sharpnose Shark, Vermillion Snapper and Ling. Mike Balendi from Enid Oklahoma with his Ling caught 1-29-16 aboard the Kingfisher with Capt. Marvin Horner. 24 Hr Trip aboard the Gulf Eagle 1-31-16 with Capt. Kevin Haller and Capt. Jeff Wilson brought in Vermillion Snapper, Amber Jacks and King Mackeral. Are you a South Texas Bird watcher? If so, this is the festival for you! The Whooping Crane Festival is an annual event that celebrates the migration of these magnificent creatures who travel to our Texas coast. This year is the 20th Anniversary of the event put on by the Port Aransas Chamber of Commerce/Tourist Bureau and has indeed been a success throughout the years. Port Aransas has become known as the “America’s Birdiest Small Coastal City” thanks to this festival. If you have never seen a Whooping Crane, believe us, you won’t miss it! These are the tallest birds in North American and by far the most prestige creatures flying around. Their bodies are a beautiful “snow” white with a crimson cap on the head. They have long necks and long legs with an overall slender body that plumps at the tail. They each have a very loud call and a unique courtship dance! With a count of only 20 birds, these Cranes were almost extinct in the 1940’s. As of today due to conservationist efforts the number of birds has risen to 600 today. The festival is open to the public with a small fee of $20 that goes towards the conservationist efforts of the endangered Whooping Cranes. There are individual tours, trips, and workshops that will be priced separately. This year’s dates are February 25-28th.Come see the official "Snow Birds" of Texas! This year’s key note speaker this year is Carter Smith, Executive Director of the Texas Parks and Wildlife Department. There will be special events taking place in celebration of the 20th anniversary including an evening painting and wine pairing class with world renowned photographer, Zhongjie Zheng. And if you’re bringing the family, a special family birding field trip is planned also! You can register online for the events and festival by using your credit cards. Be sure to check this event out, it is one that you will not want to miss! 1-23-16 24 Hr on the Gulf Eagle with Capt. Kevin Hollar and Capt. Jeff Wilson. Despite a full moon the angulars were able to bring back Black Fin Tuna, LIMITS of Amberjack, Vermillion Snapper and King Mackeral. Our 8 hour trip this week caught Vermillion Snapper Scamps, Stawberry Grouper and 14.8 lb School Master Snapper - Pending World Record aboard the Pelican with Capt James Wheeler, Pictures and details in next weeks report about the World Record. Our 12 hr trip hauled in nice Amber Jack, Vermillion Snapper and Atlantic Sharpnose Sharks. Had 2 - 24 Hr Tuna Trips returned on 1-16-16 aboard the Pelican Rod Reuter from Platteville, WI had a nice catch of Amber Jacks weighing in at 65 # & 70#'s with Capt James Wheeler and Capt John McIntyre, they caught 99 Black Fin, 16 Amber Jacks, 2 Grouper and 5 Vermillion Snapper. 1-16-16 aboard the Gulf Eagle with Capt Keven Hollar and Capt Jeff Wilson hauled in 13 Amber Jack, 28 Black Fin Tuna and 37 King Mackeral. If you’re visiting for a weekend or maybe even a month in Port Aransas during the Fall, Winter and Spring season you are guaranteed ultimate relaxation! Most people avoid our beaches in these off season months but some would rather avoid the crowds. There are many things to do in Port Aransas during these times of year and we know some secrets that keep others coming! Depending on the weather, Port Aransas can be a cold a beach town and seemingly desolate. However, for those who do take the time to travel here during these seasons know how beautiful Port Aransas can be! If you’re looking for something to do during these “off-season” months here are the top 10 things to do while in Port Aransas. Each destination has an attached URL for more information. There are several places located around town that you can take your binoculars and cameras for a refreshing nature scene. The most popular is the Leonabelle Turnbull Birding Center and Charlie’s Pasture. These two locations are remote from the town and offer nature at its quietest and best. Besides these two places, the jetty on the Port Aransas beach that faces the Corpus Christi Ship Channel offers views of not only birds but awesome ships! There are some places on HWY 361 that have entrances off to the bayside. Most of these places require a 4WD vehicle but there are some paved or caliche roads that are maintained by the state. http://www.cityofportaransas.org/leonabelle_turnbull_birding_center.cfm Leonabelle Turnbull Birding Center Website, including directions and other information. http://www.cityofportaransas.org/nature_preserve.cfm Charlie’s Pasture Website, including directions and visitor information. Enjoy a guided Whooping Crane Cruise or a chartered fishing tour aboard the Fisherman’s Wharf infamous Skat Cat and Wharf Cat vessels. http://wharfcat.com/winter.htm This is the link for the scheduled events of this year’s 2016 season! This cruise is not just for kids! Adults will love the Pirate show that is put on and will be entertained by the games the kids do play, plus drinks are served on board. Winter cruises are until January 29. Click the link above to see the schedule or call for more information! There’s not a website for this because it’s plain and simple! Port Aransas is known for the many shells that wash up on shore from the Gulf of Mexico. From Port Aransas to the Fish Pass Jetties and further south, shells are scattered all over. You can do this anytime of the day and see very interesting shells and animals! The Padre Island National Seashore is further south but always has starfish washed on shore and large shells. Take the time to walk the beaches even if you are wrapped up in sweaters and scarves! The Art Museum offers many classes throughout the seasons to all levels of artists. If you’re here for a month check it out! You may find you have skills you didn’t even know about. http://www.portaransasartcenter.org/classes-events/ Click here to the schedule of classes and the information for each one! Some do require supplies but down at the beach, your inner creativeness seems to awaken and your inspiration for art is thriving! The PACT is a group of local individuals with a love for the performing arts. Each play is very well practiced and performed, so well that you WILL enjoy it with your company! http://www.portaransascommunitytheatre.com/ Click here to find show times and ticket information! Each year people from all over the world venture to Port Aransas to see the impressive professional sand sculptures that are created on our beach! There are many contestants and extremely creative sculptures! You won’t believe these artists are only using sand and maybe a little glue to make these beautiful and detailed sand creations. www.texassandfest.org This year’s dates are April 29-May 1st. Love painting and art? Fire it! Ceramics has pieces already formed where you can select your piece and paint it! You don’t get to work the clay at this place but let your inner creator break free as you design the pot, plate, or cup of your imagination! Play a round of golf on a professional Arnold Palmer designed golf course! La Palmilla is just off of HWY 361 with gorgeous greens and fairways. The scenery lets you know that you’re still at the beach while you Tee off!